Last year when I visited Cardiff, I had the quaint idea that it might be interesting to study the Welsh language. A bit more research into that idea showed me the folly of my ways, but I remain fascinated with the country and the language. 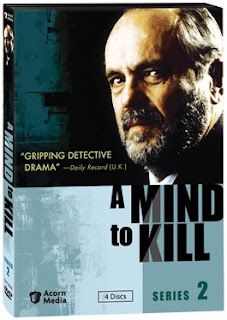 That's why I was thrilled to receive a review copy of A Mind to Kill, Series 2 from Acorn Media. This is the second season of a Welsh detective drama that ran for 5 seasons, between 1994 and 2002. The action concerns the sufficiently grizzled yet oddly attractive (he has no problem finding female companionship)Welsh DCI Noel Bain, played by Philip Madoc. Twelve years before the action in this series takes place, his wife was hit and killed by a drunk driver. This event has left a massive scar on Bain's life, as will be shown toward the end of this season. ﻿Bain has a twenty-something daughter, Hannah, who is off at college but still tends to show up and need rescuing from time to time! There's also Bain's on-again/off-again relationship with the pathologist Professor Margaret Edwards. Margaret is something of a puzzle. I haven't seen the first series yet (although I'm planning to rectify this situation soon!) so I'm not entirely sure what her story is. She and Bain flirt and spend time together, yet he is also open to overtures from other unattached ladies. Margaret also seems to enjoy her job a little too much, generally looking all too pleased as she examines the burned or drowned or the otherwise unpleasantly dispatched corpses of the recently departed! Rounding out the cast of characters are two of Bain's officers, DS Alison Griffiths and DS Carwyn Phillips. They appear genuinely fond of their somewhat cranky and unpredictable boss, although they do smirk behind his back at his relationship with Professor Edwards. The series takes place in Wales, which provides a magnificent backdrop to the horrible crimes that Bain is forced to investigate. There is some forest shown, but for the most part, the hills are quite barren and stark. Maybe that's why the people who live there get up to such mischief! One fascinating aspect of the series is that it was filmed in both English and Welsh versions. This DVD has the English version (of course), but you can watch 7 minutes of one of the episodes in the Welsh language. It's a very beautiful and mysterious sounding language! Even when the actors are speaking English, their lilting Welsh accents are very pleasant. The 7 episodes on this DVD deal with horrible murders and hostile members of the public. In one case, two brothers are found tied together at the bottom of a lake, and Bain must work out if it really was a murder-suicide (as it appeared to be at first), or a double murder. In another case, Bain goes undercover at a seaside resort town to look for a killer, but things are complicated when his daughter Hannah shows up. Another episode deals with a housing estate where residents don't take kindly to the police coming in to investigate the discovery of a burned body in a car. I found the most unusual episode to be the last one, in which Bain decides to track down the man who was responsible for the death of his wife 12 years previously. All in all, this was a very interesting entry into the detective fiction genre. I really enjoyed the stark scenery and the (for me) unusual accents. I hope I can find the rest of this series to find out what happened to Bain and crew in future seasons!